This Tree Stand for Artificial Christmas Trees has a 29 inch leg span and they will hold an Artificial Christmas Tree with a 1.25 Inch diameter tree pole. No assembly is required for these Christmas Tree Stands . These Heavy Duty Metal Tree Stands are ideal for trees between 6.5 and 9 feet tall. To protect the paint on these Tree Stands they should be placed on a cloth (if on a hard surface), or onto a carpeted floor. Do not drag these stands. 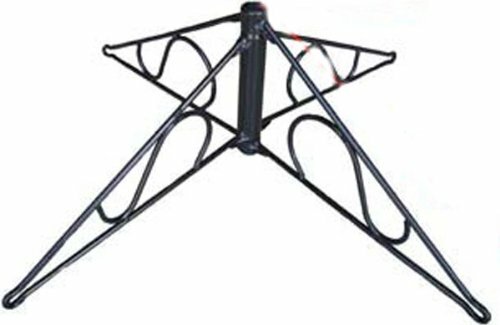 Tree Stand Dimensions: Height = 8inch; Diameter = 29 inch; Width of Wide legs = 6in - 1in; Width of Slim legs = 4in - 1in; Diameter of Pole (needed) = 1.25 inches; Minimum Pole Length (under tree) - 5.5 inches; Above ground - 1in. If you have any questions about this product by Tree Stands, contact us by completing and submitting the form below. If you are looking for a specif part number, please include it with your message.